There are 7 dolls in the nest. 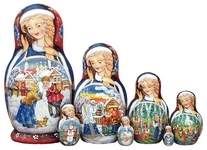 The scenes from the Russian fairy tale are depicted on the dolls. Once upon a time there lived an old man and woman who had always regretted that they did not have any children. One lovely winter day they made a girl out of snow. 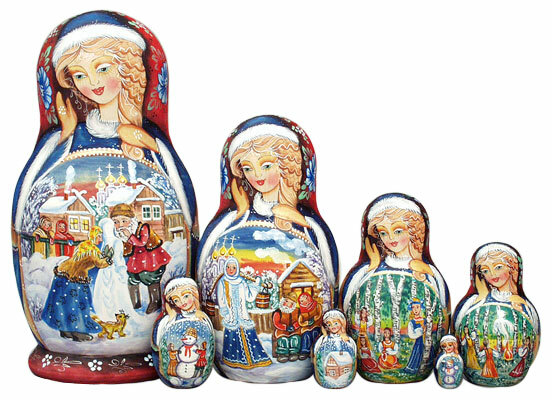 The snow maiden came alive and became the daughter they never had. 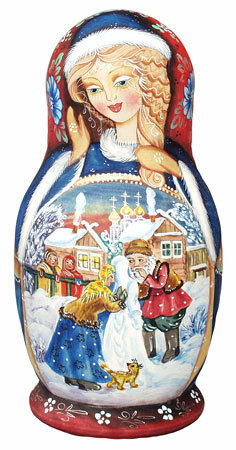 They called her Snegurochka. She was very beautiful and sweet. But when spring began to warm the land, the girl became quite depressed. When the summer arrived, she became even more sad. Once she went to the wood with a group of village girls to pick flowers. She had a good time for the first time since the winter. It began to get dark and the other girls made a fire and began playfully jumping over the flames. 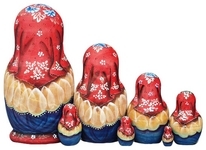 Snegurochka also jumped, but suddenly melted and evaporated into a white cloud. 8", the smallest - 1"